As some of you may have heard, our team formally launched the Movenbank project at SIBOS yesterday. It’s an auspicious start, for a very ambitious project. The buzz at SIBOS was stellar, with some major support coming from the Twiteratti, from the “InnoTRIBE” and the bloggers in our unique community. Having said that, I’m under no illusion that this was only the start and we’ve got some heavy lifting over the next few months before we launch our consumer service. I thought in the spirit of Innotribe’s theme this year I would talk briefly about what the launch means, and what we’re going to do. But more than that, I wanted to share with you the specific challenges we’ve had to fight to overcome and why I believe we very aptly classify this as a reboot of banking. I don’t want this to be an advertorial for Movenbank – I’d like to expand on what was discussed at SIBOS, and I think sharing our thinking and challenges is instructional if you really want to change the way your institution engages customers. We believe that generally the way banks work with customers is totally broken/screwed. How many customers want a more transparent relationship with their bank (and I don’t mean just fees and interest rates?) How many have had a request for credit turned down and scratched their head to understand why? How many wonder what those mystery fees are on their statement, or why they were even charged in the first place? How many have wanted to increase their credit limit on their card or get a loan, but simply didn’t know how? These are questions the average bank consumer asks all the time – let alone questions about complex products, or the dizzying array of choices around asset class, rate, features, etc. The industry talks about ‘educating customers’ so that customers understand products. But we believe if you have to educate customers before they understand your product, you’ve already lost the opportunity. In trying to find a way to better articulate the day-to-day relationship with customers we realized that lack of trust, the systemic resistance to transparency that has become apparent as a result of social media, etc, the tendency to leverage information scarcity as a revenue/margin tool, and the lack of flexibility in current risk assessment models – all needed to change if we were really going to do something new. Fortunately, the solution manifested itself in the form of CRED™. In creating a behavioral, social, viral, gamified engagement system, what we were really trying to do was change the way our bank communicates with customers about their relationship, and the way we assess their value to us as an institution. It had to be something visible and easy to understand for consumers, but it had to have enough depth that it could not only accurately assess risk, but also enable us to satisfy the requirements of regulators. Sounds complex right? Well it turns out that if we ask questions of customers gradually, allow them to transact, and tell us how they spend and save on a daily basis, we can build up not only a complete KYC/CIP profile, but we can also start to help customers manage behavior that is risky. The problem with current credit scoring models is that they only record a failure after it’s happened, but we realized we should be able to anticipate that failure by watching the way customers behave. Rather than being invasive, most of this was available based on the current aggregated data for a ‘banked’ customer. If the customer was unbanked, we were going to have to build it over time. The final element is really the gamification. What I don’t want to do is give the impression that we’re making banking a ‘game’. We’re using the principles of gamification for engagement. We will have some of the standard bells and whistles like badges, rewards and incentives, but the real secret to understanding CRED gamification is understanding how we will deliver banking products and services. One simple trick – if you want someone to keep a positive balance in their savings account – then allowing them to see that balance or reminding them that a specific transaction or event will take them into negative territory, makes the spend a conscious decision. Is it gamification? It is when you ‘game’ the messaging, and make it frictionless or even fun. We’re playing with that messaging and engagement layer to influence your financial health positively. So maybe we should more accurately call CRED Engagementfication or Contextualization, rather than pure gamification. We’re all about positive persuasion, based on very clear and ethical permission sets. One of the real questions was should we or shouldn’t we start with our own license and charter, or do we go the BankSimple route and work with partner banks. In the end this decision was really taken out of our hands because there were no guarantees on either the outcome of the license/charter application process or the timing of such. Purely on a commercial basis, if we wanted to go to market, we couldn’t wait on the regulators to make the call. That’s not to say we might not acquire a bank in the future or build our own for purposes of scale. So what about KYC (Know Your Customers)? It turns out that KYC requirements in most jurisdictions are not that exhaustive – it basically boils down to name, date of birth, physical address, unique identification (Passport, Social Security Number, TIN, etc) and verification of that identity. The rest of the ongoing KYC stuff is typically around transactional behavior (e.g. AML suspicious transaction reporting). The fact is, the workload of this stuff is not erroneous, nor does it require an absolute physical presence (at least the way we read the regs). In fact, we will have much more data on the behavioral side and on the customer’s profile than an average bank. For example, which bank do you know that requires you to have a Twitter or Facebook account and a mobile phone number before you can sign up? That’s much more useful than insisting on utility bills before you open an account in our opinion. Lastly, on the product side, CRED™ will simplify much of this space as well. In most cases, customers will be engaging with Movenbank for a facility, whether it be a day to day transactional account, a savings ‘bucket’ for a specific goal, or a line of credit for those times you need a bit of extra cash. The utility of banking means that we believe as long as the rates are competitive, you don’t need to describe or understand the features of that product – you just want to use the ‘utility’ of the product. So CRED will be the interface to this, and we’ll turn on and off the utility of those products or services as required. Given we’ll already have all of the KYC up front with CRED as the engine of the relationship, you won’t need any application form, it will just be turning the facility on or off. The Alpha Release of Movenbank’s site is scheduled for October the 1st, where customers will get their first glimpse of the CRED ecosystem through a financial personality profile. Then we’ll be ramping up for a staged commercial release next year – with broad availability schedule for the summer of 2012 (summer in the Northern Hemisphere that is). It’s an exciting time. We’d love your feedback and love to have you along for the ride. Rebooting banking will require your participation as well. Thanks for your support and encouragement. In September of 2009 Ann Minch, a customer of Bank of America, posted a video on YouTube called the “Debtor’s Revolt”. Ann detailed her case against BofA who had unilaterally increased her credit card APR (Annual Percentage Rate) to 30% from its historical 12.99% – quite a jump. She argued as a customer of 14 years, having never missed a payment, that such treatment was unjustified. She contacted BofA and asked if they would discuss her situation or negotiate the rate change, but they referred her to a debt consolidation counselor. BofA subsequently argued that the terms and conditions she had signed allowed them to make any adjustments of this nature without consultation with customers like Minch. If she didn’t like it, she was free to cancel her card and go to another bank. This wasn’t the end of the story. Half a Million YouTube views later mainstream media started to pick up Ann Minch’s story. The pressure was suddenly on BofA to explain their actions, and the story that they were within their legal right to do so, just didn’t stand up to cross examination. All but BofA believed that their actions were unreasonable and extreme. The resultant pressure resulted in a complete reversal of BofA’s decision, a win for Ann Minch right? The Ann Minch story, and that of David Carroll with his YouTube-generated hit United Breaks Guitars, tells us that today consumers have extraordinary power afforded to them through social media. Consumers today have a voice, but increasingly that voice is becoming about choice, about rewarding organizations that listen to customers, and punishing those that think their decisions are immune from debate or dialogue. Prior to social media, Ann Minch wouldn’t have had a hope of getting a behemoth like BofA to change their policies or decisions based on her complaint. But it’s not just the voice of consumers on Twitter, Facebook, Google+ or social media more broadly. A plethora of user driven recommendation apps and tools are coming to the fore in helping consumers choose organizations that respect customer involvement. There’s Nosh and Yelp apps that help consumers choose restaurants that they like, that provide great service or great food. There’s Trip Advisor that has become such a powerful force in the travel game that it gets 50 million unique visitors a month who use the site to select hotels for their family vacations. Then there are staples like iTunes and Amazon (who arguably pioneered the consumer product rating mechanism) who rank listings of their products based on consumer votes and reviews. Today we’ve seen the launch of First Direct’s new FD Lab as a worthy attempt to engage customers in the future of the bank from a service and product perspective. Today we live in a world where you can no longer provide poor service based on outdated rules, processes and policies and argue “hey, were a bank and that is the way we do it”. Today, if you are a bank and you have stupid rules and regulations that have been perpetuated by processes built around unwieldy mainframe transaction systems, or around KYC processes that are overkill for 95% of customers and their day-to-day interactions – you are setting yourself up for a fall. Banking has been for the longest time built on the premise that you have to jump through a bunch of hoops to make yourself ‘worthy’ as a customer – you have to prove yourself before the bank will deem you suitable. As bankers, we argue that it’s not our fault, that we are saddled with regulations and requirements that force our hand, that require us to approach customer engagement in this way. That kind of thinking is institutional laziness and denial – it creates friction that frustrates customers, is largely unnecessary and is generally costly and inefficient. Let me illustrate. Take a long-term customer that walks into a branch (for the moment forget my post last week on the decline in branch visitation :)) and applies for a credit card or investment class product after say 10 years of a relationship with the institution. In by far the majority of cases he or she’s sat down in front of an officer of the bank, handed a blank application form and required to fill out details that the bank has had on record for a decade. Why? There is no process, rule or regulation that can possibly justify that kind of inefficiency and poor service. If there is a requirement to get a signed consent or legal record of the customer’s acceptance of certain terms and conditions, then print out the required document with all his/her details pre-filled, ask them to initial to confirm their details have not changed, and sign the acceptance of the T&Cs. What is so hard about that? Recently at my annual review with my relationship manager at a major brand bank, I was subjected to a 7 minute video on the risks of investing in Collateralized Debt Obligations (CDOs) and the fact that I might lose all my money if I invest in this asset class, when I was, in fact, applying for a product that was a low-risk Corporate Bond in a totally unrelated asset class. Why the video then? Because someone in legal and risk decided all customers should sit through this video to reduce risk to the bank. Stupid friction. Take a customer who forgets his Internet Banking password today. How many banks require him to come to the branch or sign a convoluted document and fax it to the bank to unlock his online account? I know at least two of my bank relationships do. Take a wealthy HNWI (High-Net Worth) customer that moves to the USA or UK from a foreign country and applies for a credit card, only to be rejected because he has no credit score – therefore doesn’t exist in the system so he can’t be assessed from a credit worthiness perspective. None of these rules makes sense, and yet banking is choc-a-block full of such friction and opportunities for disenfranchising customers. This is the perfect storm in today’s user advocated consumer world of open, transparent choice. The problem with outdated rules, processes and procedures is that thinking “we’ve always done it this way” or “if you don’t like it you can leave” is simply no longer a viable argument to an increasingly well educated and informed customer. Already we’re starting to see customer advocacy as a key driver in choice of financial institution, and high visibility for customers who voice their dissatisfaction with such friction. @DavidBThomas I’ve been with my bank for 30 years. They “thank” me by telemarketing me at dinnertime. @NewsCut My bank — TCF — has a security question “What city is your vacation home in?” My bank really doesn’t understand REAL America. @StevenValentino I hate my bank and I would happily shove what little money I have into my mattress if the FDIC would insure it. @MadRainbowLtd Halifax bank are sh*t! They let someone clear out my bank account using an old cancelled debit card! @docbaty 6) checked new calculations with manager, while making me wait. @docbaty 7) failed to apologize. Now imagine the next generation of customers who are out there looking for a new institution to engage with right now. Where are they going to look before they decide on a life-long relationship with a financial institution? They’re going to ask their peers. They will search on a product or brand and find search engine results prioritized, not by some clever search-engine-optimization techniques, but by how their friends and networks have scored the performance of that bank or credit union. They’re going to ask for recommendations on Facebook, Twitter or Google Plus, and they’re increasingly going to choose new providers who think out of the box and who work on simplicity, great customer journeys and improving customer experience through better interactions. What used to happen informally now is being hardwired into the brand selection process. What marketers used to call the ‘choice set’. We’re learning that this process can’t be gamed, manipulated or bought as a result of ad spend. We’re learning that the most effective mechanism is simply being great service businesses and listening to customers when they’re not happy. The process is brutal, it’s transparent, and it’s going to kill your brand unless you are honestly engaging customers, and you try your hardest to get rid of those pesky, stupid banking rules that only make sense to us as the bank – and even then, let’s be honest… they don’t really make sense to us either. My pals at BankSimple soft launched their debit cards internally for their staff this week, which is big news because it signifies the acceleration of the big shift in the BANK 2.0 landscape. Interestingly, though, this launch wasn’t easy, as the team at BankSimple articulated on their blog post of today. The last many months have taught us greater patience. It is difficult to change an industry. But we’re leaning into it and can’t wait to show you what we’re building. Thank you for your patience. The BankSimple launch is significant for a number of reasons. First of all, when was the last time you heard of a new bank having 50,000 customers signed up or registered before the bank launched?? Secondly, the fact that BankSimple doesn’t have a banking license of their own, is no hindrance in offering better banking service today. Lastly, if you are going to change an industry, be prepared for some resistance. Viral Banking – who’d have thunk? Banks are notoriously hopeless when it comes to social media. However, Apple, Google, Mint, BankSimple, Square and others who are increasingly stepping on the toes of traditional banking players, are extremely adept at garnering customer support for their initiatives through viral marketing, social media and digital advocacy. It is incredible that in an age where LinkedIn is worth $9Bn (40 times revenue), there are still some major bank players like RBS and HSBC that don’t have a Twitter account. I know the transition from a controlled media and brand messaging environment to a conversation sometimes dominated by customers, is a difficult leap, but it doesn’t mean you can’t live in this new social world. I know there will be cynics out there that would say that RBS and HSBC probably hasn’t actually lost any revenue from not being on Twitter – personally I wouldn’t be sure about that. One thing I am sure of though, is that I can guarantee that they haven’t signed up 50,000 new customers as a result of digital presence on social media like BankSimple has. This is the new way of acquisition. Be a part of the conversation, garner customer advocacy, simplify the engagement and enable relationships digitally. If you aren’t living in the viral, social, conversation space – be prepared to be marginalized as a service provider in the retail banking landscape. I’ve previously talked a great deal about the customer experience gap and how banks are moving further and further apart from their customers due to lack of behavioral sensitivity and poor user experience, but this is more. BankSimple is working with a raft of back-end providers that hold a banking license and can offer an FDIC guarantee on the deposit, but that doesn’t mean that the holder of the deposit or the issuer of the credit product, actually owns the customer. For years we’ve seen this in other industries where manufacturing of products and services is separate from the distribution network. The distribution network of the retail banking sector is under enormous pressure today. The BankSimple approach is the first of a massive shift away from traditional distribution channels where owning a branch network no longer means squat. Physical distribution network didn’t save Borders from collapse, nor did it save Blockbuster, Encyclopedia Brittanica, MGM or countless music stores. In this shift away from physical to digital distribution, it is almost always new players that start to dominate. In the case of books – Amazon. In the case of music and video – Apple. In banking, it is too distributed and widespread, along with too heavily regulated, for one single global player to dominate the new banking interface. But one thing is for certain. We are about to see a whole new layer of retail banking interface or customer experience that doesn’t need a banking license. If you think banking is “special”, then just keep thinking that while you slump into irrelevance. The new bank is the customer experience bank. The chaps at BankSimple have found out that trying to change the paradigm of retail banking takes cojones. It also takes patience. There are a whole raft of embedded bankers who don’t want to see the world change. I liken this to the MPAA’s response to the whole bittorrent landscape, or the RIAA’s response to Napster. When the shift started to happen the traditional industry first denied it would ever happen, when it did start to happen they fought it with everything they had, and in the end they were screwed anyway. The same thing will happen with banking. No matter how secure you think your relationship with the customer is today as a bank, the fact is if you can’t enable me to bank in a better way, then you are irrelevant. Someone else can put a new layer of customer experience over the top of your banking license and do it better, faster, cheaper and sexier than the traditional players. At the end of the day physical cash, cheques, plastic cards, and branches are all elements of the banking system that are ripe for digitization. The longer you keep fooling yourself that this transition is going to take years, and the banking sector has plenty of time to adapt – the easier it will be for BankSimple and others to eat your lunch. Ok, so the feedback from Finextra’s #finxsm event this week is that we’re finally coming to grips with the fact that Social Media isn’t going to disappear into the night like some passing fad. Good news! It’s interesting though, whenever a major disruptor like social media, the internet, etc has come along, inevitably there are many traditional managers and practitioners who don’t understand it and label it as a ‘fad’. Just because you don’t understand something personally, doesn’t mean it is a fad. That’s the realization that the industry is going through right now, that is – social media isn’t a fad, it isn’t going away, we need to deal with it. Just because we don’t understand what the fuss is about doesn’t mean our customers won’t use it, and if they’re talking about us we better be listening. So the first trick with social media and how it’s going to effect the business is learning about how it works. The knee jerk reaction for most banks when social media came along was two fold; The first was to try to figure out how to dump traditional advertising and PR campaigns down the pipe. The second was to shut down any access internally within the organization because it was risky for employees to talk directly to the public, and also because it was feared there would be wholesale time wastage from staff playing farmville and other sorts of unproductive, non-work related tasks. The problem with this mind-set is that is was fundamentally wrong. Primarily, the organization was prevented from learning about the real capability of social media, and this hampered the brand from creating advocacy and engaging customers. Additionally, the reality was that employees were simply pushed away from the desktop internally to their mobile device and the risks that employers were hoping to prevent by shutting off access weren’t prevented they were simply pushed outside of a controlled environment. The marketing-led thinking about attempts to control or spin the brand message out through social media characterized as just another broadcast channel, are also fundamentally flawed. Social media is more akin to a dialog with your broader customer audience, not a channel for slamming more corporate comms or campaigns down customer’s throats. Thus, the traditional marketing metrics don’t apply either. Having said that, while not being a broadcast channel, it is a channel for targeting key influencers to get your message out. Key influencers are those with a sizeable following (1,000 followers or more) who influence their follows – i.e. get lots of retweets, reposts, etc. Recently when Charlie Sheen burst on to the Twitter scene garnering 3.5m followers in just weeks, what did it mean for key influencer opportunities? Ad.ly worked with Sheen to promote internships.com, a new jobs board – one tweet from Sheen got more than 100,00 applications from 181 countries for the #Tigerblood intern spot. No classifieds ad in any newspaper has EVER been able to get that sort of response. Lesson: Engage key influencers! So now that we know social media isn’t a fad – what happens next? One of the biggest challenges is figuring out who is going to manage social media internally in the business today. Often this falls to some junior marketing staffer, maybe someone in the online team or perhaps a corporate communications or PR team member. All of these decisions would be wrong. Social media can be used to build brand and advocacy, support and service customers, research new strategies, design new products, create new markets, and to educate and inform. This is going to require a whole kaleidoscope of supporting skills sets and capabilities underneath to do this properly. So if you limit it to being pigeonholed into the current organization structure, somewhere along the line your social media strategy is going to be deficient. Do you have a head of call centre? Where does he sit in the organization chart? Well the head of social media should be at least equivalent in the organization chart to this resource. Why? If a customer like Ann Minch, David Carroll decides to target your brand because of poor service, bad policy or just plain ignorance, your share price is going to start to take a hit. The strategy shouldn’t be to try to shut it down or attempting to force employees to refrain from social media activity. When Commonwealth Bank attempted this it backfired badly. The strategy needs to be one of informed engagement and encouraging positive use. The biggest risk FIs face today is reputational risk associated with a social media blowout. You need someone in charge with common sense, but also with the organizational wherewithal to actually get something done. This is not a junior role. You need a policy that encourages participation across the organization, but that provides strong guidelines, supported by training, on how to engage customers and how to support the brand through social media. But most of all you need a mechanism to take what you hear from your social media listening post and inform strategy, change policy and improve customer experience. That is the potential of social media that is so underutilized today. 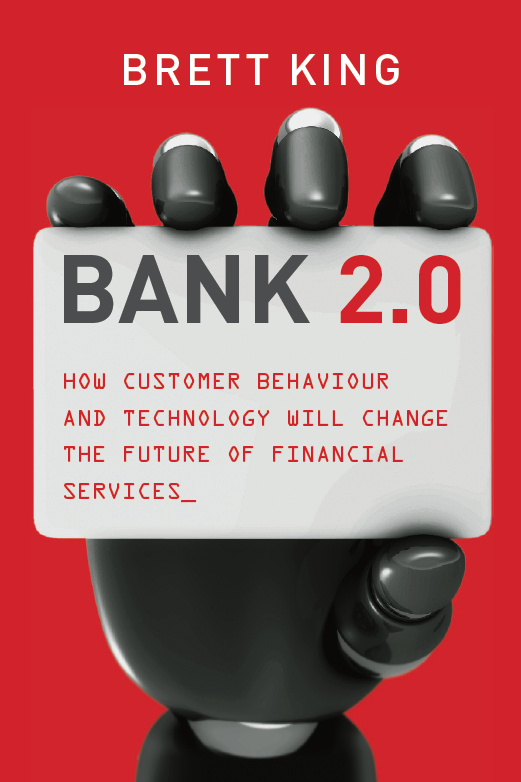 Since the emergence of online banking there has been a fundamental assertion from high-net-worth bankers that their clients aren’t digitally focused, they don’t use social media or mobile banking, and that they prefer to pick up the phone and engage their banker because the nature of their interactions is defined by their wealth – they want the highest-level of service that only comes from engagement through a personal banker. Is this business immune to disruption, despite the rest of the retail bank being in an extremely disruptive state? It’s apparent that Private Banks are now seeing customers move more frequently to multi-bank relationships because the basic digital hygiene factors within the Private Bank are not taken care of. For a Private Bank to claim that they are the best of the best, but to be amongst the worst digitally is contradictory. So the depth of the relationship and scale of AuM (Assets under Management) are suffering because of lack of web, mobile and social capability, and Private Bankers are seeing a fragmentation of service offerings as a result of service perceptions. If we look at High-Net-Worth-Individuals (HNWI), the facts are that they are extremely service conscious and generally loath inefficiencies. Entrepreneurs and successful business people in the HNWI category were the first to get Blackberry’s, the first to get wireless broadband modems so they could work on their laptop in the limo from the airport to the office or sitting in the Maybach running around town, amongst the first to get the cool new iPad or the latest gadget. So right now, clients of private banks are asking – why can I login and do this day-to-day stuff through HSBC, Barclays or BofA, but I can’t through my Private Bank? So where does technology fit, and can it provide real value? Is there a way that technology can deepen relationships with clients, or does it mean that relationships are less sticky because they are doing more interactions with the brand electronically? Recently a well known ex F1 driver and commentator was spotted on Twitter asking his Private Bank, Coutts of London, whether they had a local branch in Miami. The Coutts team respond within just a few minutes of seeing that enquiry come past the Twitter account and letting the F1 driver know that his Banker would be on the phone to him in a jiffy. Such a response is not the norm. When presented with this sort of scenario, many Private Bankers scratch their heads and ask why a distinguished client like an ex-F1 champion would use Twitter to talk to his Private Banker instead of a simple phone call? That’s not the point – you can choose to approach every single client and ask them why on earth they would want to use Twitter, or you can simply understand that an emerging channel like Twitter needs support. As the next generation of Private Banking clients start to take over from their parents, the last thing you want is to be identified as that stodgy, old, out-of-date bank that my father used. Perhaps the biggest revolution is in the primary face-to-face asset allocation meeting with the client. Over time we have gradually increased complexity as a result of KYC and risk, for what used to be a simple chat between a client and his banker. Now we load up our client with forms, risk profile questionnaires, with brochures, technical data, etc. that doesn’t actually enhance the relationship – it just complicates it. Soon we’ll be asking the client to do the risk profiling stuff at home online and we’ll verify this with the client face-to-face. We won’t ask the client to fill out the same compliance information on a paper form that we’ve already asked for 20 times before, because we’ll execute electronically using the data we already have stored. When we sit with them in a planning session, we’ll use tablet based tools that allows us to show our clients what-if scenarios and adjusted asset allocations that work better for them, then we’ll give them a selection of product decisions which they can learn more about at home online or execute electronically from behind the login. Why? The real revolution here is in simplicity of the interaction. By maximizing time with our client for discussing their needs, and shifting other activities to supporting channels, we improve service levels. Even the humble monthly statement will be digitized with interactive components explaining market movements, the client’s net position and short-term investment opportunities. In respect to client acquisition, the world of transparency through social media will increasingly start to impact banks in the coming 2-3 years. Brands and private bankers will be anonymously scored online as to their effectiveness. Just like dating services, social networks will be able to match bank’s relationship managers with clients based on their expertise, location, and their ranking amongst peers. When we search for Private Banks on Google or YouTube, what results will we see? We won’t any longer see the most popular brands, but the most respected brands amongst our peer group based on your social score. Unless you have a strong connection digitally with your clients, your social score is going to hurt you on the acquisition side of the business. After all, Private Banking is first and foremost about trust in your advisor – if my friends don’t trust and recommend you, how can I trust you? Once thought immune to the changes in multi-channel engagement, it turns out that perhaps the most important clients in the retail banking marketplace need to be highly connected, to provide the required service levels. For most private banks, this is an epiphany and hence, we’re seeing aggressive investment in this space today. If you want to be the trusted advisor – it is clear you need to be connected and recommended. Engagement is no longer limited to a phone or face-to-face, the private banker must extend his reach to clients at every opportunity. A deeper relationship, depends on context and connection – not just a brand and asset management capability.